"Bali recognized by world because culture and coast, has other place which able to in enjoying, West Bali National Park, place presenting nuance differ from this deity island has view of fascinating nature. Various types Flora and Fauna are having status rareness and can enrich our knowledge about this area. This park is a nature conservation area which has the original ecosystem, working to protect a wide variety of wild flora and fauna. Covering the sea, beach and the mainland coast, lowland forests, and mountains." Barat National Park was founded in the year 1941. 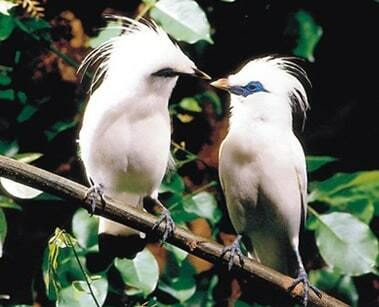 It was originally an initiative by the Dutch with the purpose to protect the endangered Bali Starling bird and the last remaining wild banteng, a native animal from which most of the Balinese cattle descend. It had been considered the last refuge of the now extinct Balinese Tiger. The park is relatively young and it's the only National Park on the island. Barat National Park is located about four to five hours from Denpasar or 90 minutes from Lovina and covers most of the northwesterly point of Bali. Popular starting points for obtaining permits and subsequent treks and tours through the park are the ranger stations in Terima Bay, Cekik and Gilimanuk. Because of the heat and the mosquito's, a visit in the morning is recommended. The park is managed by the Indonesian Forestry Service and to keep the hordes of visitors at bay and protect the nature, only a few narrow trails lead through this pristine piece of Bali. If you plan to explore the park, you will have to hire an official Park guide. 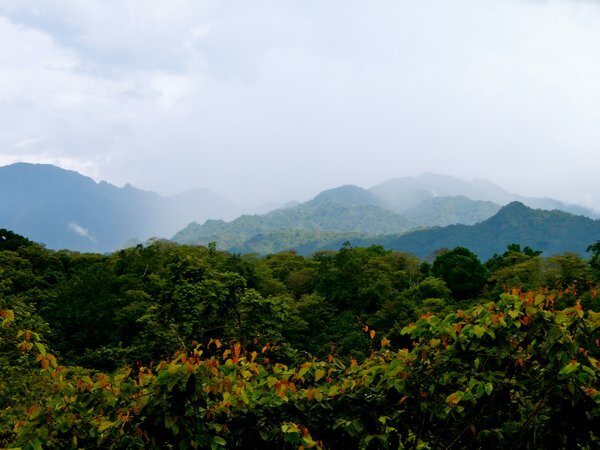 The National Park is mountainous and consists of primary monsoon forest, mangrove forest, lowland rain forest, savannah, sea grass vegetation types, coral reefs, sandy beaches and both shallow and deep sea waters. Just a small part of the park is actually accessible and divided into zones defining what activities are allowed. Diving and snorkelling is a popular activity at the offshore coral reefs surrounding Prapat Agung Peninsula and Menjangan Island, bird watchers will find the most bird life along Tegal Blunder Trail and hikers as well as other animal spotters can enjoy trails both easy and difficult. The center of the park is dominated by remnants of four volcanic mountains from Pleistocene era, with Gunung Patas at 1,412 metres its highest elevation. The park is surrounded by six small villages with a mixed ethnic population (Balinese, Javanese, Madurese and Bugis). Administratively these villages are either governed by the Buleleng or Jembrana district. At the peninsular Prapat Agung one will find an extensive web of footpaths, which makes it the most accessible part of the park. The cape is cut off from the rest of the reserve by the main road Singaraja-Gilamanuk, as well as by several forestry plantations inland of Teluk Terima. At Menjangan island you will find hectares of colourful coral reef gardens, which makes it a perfect destination for snorkeling and diving. The Park has a high potential of flora and fauna. Among them are 14 variety of protected floras involving Sawo Kecik (Manilkara Kauki), Sono Keling (Dalbergia Latifolia). From the fauna, Jalak Bali Birth (Leucopsar Rothscildi) is one of the endemic fauna on the island. Their habitat can be found in this park along to Prapat Agung and surrounding area. Other faunas can be found at this park involving cow, deer, mouse deer, venison, wild cat, grey and black monkeys. Beside of the above animals, a couple of reptiles and other 60 rash of births also can be found. The condition of coral reef at this park is highly varied with unique combination and multifarious of habitats. In year 1998, it was recorded 110 kinds of coral including 22 mushroom corals and up to now, it was recorded that this park own 222 kinds of fish. 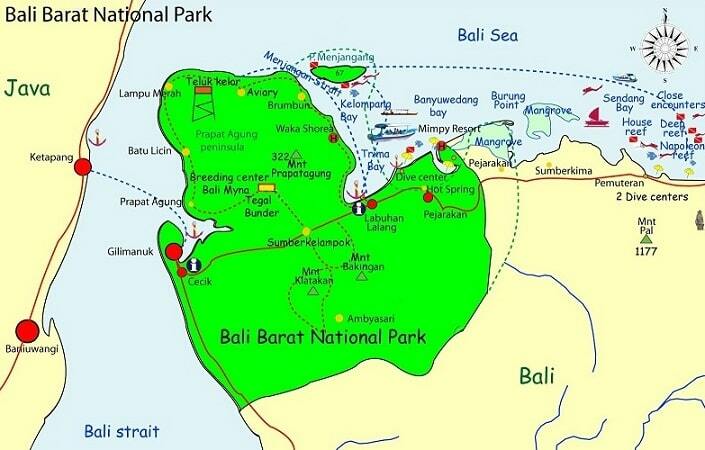 Bali Barat National Park is easy accessible from Gilimanuk, the ferry port where ferries to and from Java come and go. Gilimanuk is reached by ferry from Java or by bus from Denpasar or Singaraja. From Gilimanuk take a minibus or ojek to Cekik for the last three kilometer. Here you will find the PHPA headquarters. 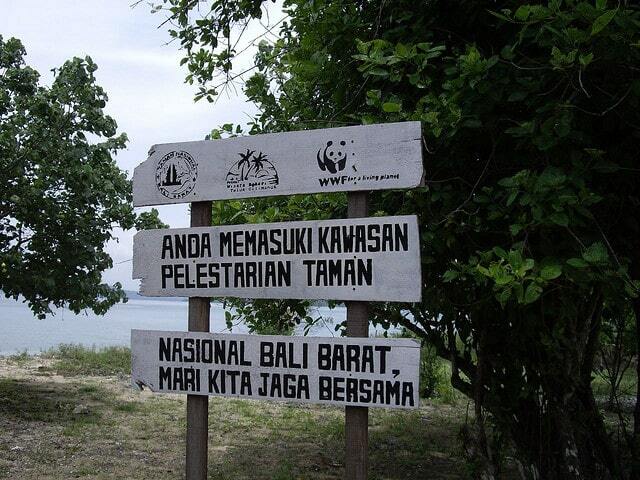 An other entry point is Labuhan Lalang, accessible by minibus from Gilimanuk. Labuhan Lalang lies at the main road to Singaraja, which cuts through the park. To reach Menjangan island you can hire a motorboat from Labuhan Lalang (30-40 min). Singaraja-Seririt-Cekik by car (85 km). Permits and Guides Permits and hiring of guides: at the PHPA headquarters at Cekik, at the PHPA office in Labuhan Lalang or at the PHPA office in Denpasar. The best time of the year to visit the Bali Barat National Park is at the end of the dry season / start of the wet season, roughly from August to December.